We hear so much about how flush American companies are with cash. Pundits are out there talking about how much cash corporate America has. But this story is highly misleading. 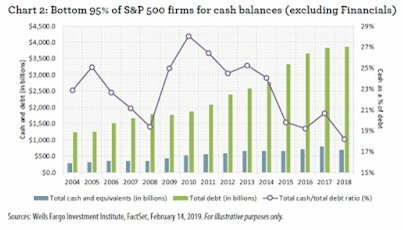 If you look at the graph below, 5% of S&P 500 companies hold more than half the overall cash; the other 95% of corporations have cash-to-debt levels that are the lowest in data going back to 2004, according to Wells Fargo research. We know who those 5% are — they are the GAFA companies: Google, Amazon, Facebook and Apple. Corporate debt is exploding, and can be more addictive than crack or opioids. Debt is fine when things are going well, but when revenue stalls, bad things can happen. A concern about committing their own cash in a material way to fund their supply chain impacts DPO negatively. Companies understand funding suppliers early is not something to do one month but not the next. It is a commitment. The reward structure for treasury does not provide an incentive to be aggressive with early pay solutions. Companies, and the people who run them, are very rational. If there is no clear incentive to do so, they will not pursue early pay solutions. Models are based on looking at cash as a resource. Large company cash priorities are focused on managing the balance sheet and having options. Those options could be share repurchases, committing to dividends, M&A or research. Flexible funding enables a company to have an “option.” Fund early pay finance with your own cash if and when you want, with whatever currencies you want or use a third party. If you have seasonal or unexpected cash needs, you can turn off the self-funded option and have the funder provide early payment to your suppliers. If you are flush with cash at your Canadian entity but not in the U.S., you can fund your Canadian suppliers but use a third-party solution elsewhere with one button. That’s how easy it should be. Some companies may consider a bank line of credit, but that adds to debt levels and, as I said in a previous post, you may prefer a root canal before working with your bank for line set-up and maintenance, so this may not be a preferable option. Working with a marketplace backed by institutional investors provides a non-balance-sheet option that can fund a company’s total supply chain. Investors look at these assets as short-term fixed income and are hungry for good quality assets that have the proper operational controls. So when considering dynamic discounting solutions, it seems imperative to have a third-party solution as a flexible option. Because, while it seems American companies are cash-rich on paper, data can be misleading.